Some versions of the Adobe CS3 Suite, which includes PhotoShop and Illustrator, cannot see Adobe Type 1 fonts that are installed in the Windows Fonts folder. Your collection of classic Type 1 fonts is available in other applications such as Word and Excel. But in Photoshop or Illustrator CS3, the Adobe Type 1 fonts are missing. The purpose of the Windows Fonts folder is to provide a common font repository for all applications. So if you install a new font, such as Adobe Garamond, that typeface should then appear in all your application font menus. However, Adobe CS3 applications cannot see Type 1 files installed in the c:\windows\fonts folder. The solution is simple. 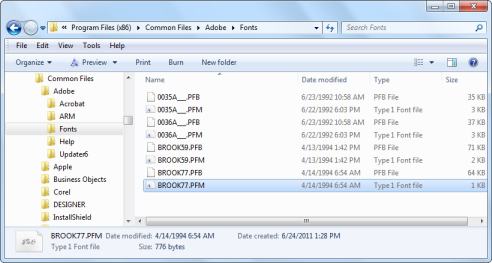 Instead of putting the Type 1 fonts in your c:\windows\fonts folder, add them to the \program files\common files\adobe\fonts folder. The exact steps are outlined below. Shut down any Adobe Suite CS3 applications that may be running. Copy the PFB and PFM files for each Type 1 font to the adobe\fonts folder. If you want to have the Type 1 fonts available to other Windows applications, you need to also copy the fonts to the c:\windows\fonts folder. Restart Adobe Photoshop CS3 - your missing Type 1 fonts should now be there. We could not find any official documentation about this from Adobe. But you can find more information in the forum threads listed below. If you have anything to contribute to this topic, please let us know.